OUR Personal Training coordinator Jenn has done us proud once again, completing a gruelling Iron Man in less than 11 hours. 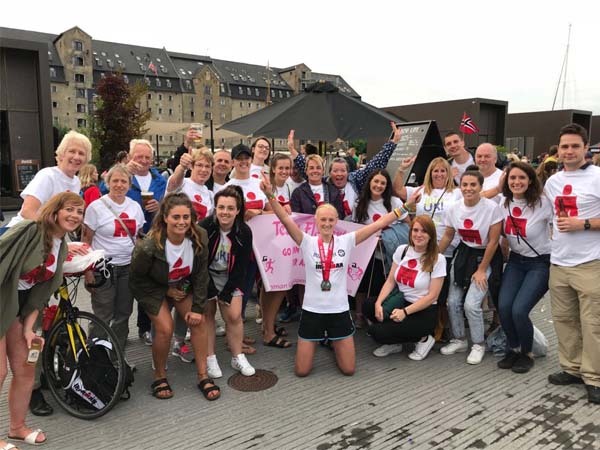 Jenn Flaherty decided to take on the challenge of a 2.4 mile swim, a 112 mile bike ride and then 26.2 mile run in honour of her auntie Helen who suffers from pancreatitis. Jenn said: “I did the half Iron Man and my auntie actually collapsed on the day. Everyone always said to me when I’d finished the half, so when are you going to do the full one? Over 20 of Jenn’s close friends and family travelled to Copenhagen where the race took place to cheer her on from the side-lines. Jenn completed her Iron Man in 10 hours 57 minutes and 36 seconds, which was quicker than her target time of 11 hours.